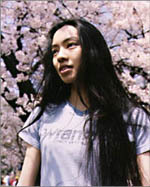 In 1996, Makishi Satoko, under the moniker "Cocco," made a modest debut with a three-song, self-titled EP on an independent label. Four years later, her third album shot up to No. 1 on the Oricon charts a week after its release. Described as a "Japanese Fiona Apple," Cocco delivers some of the hardest music to come out of Japan but sings with a clear, pristine voice. She also writes all of her lyrics and most of the music in her songs.